I'm implementing a homespun version of Ridge Regression with gradient descent, and to my surprise it always converges to the same answers as OLS, not the closed form of Ridge Regression. This is true regardless of what size alpha I'm using. I don't know if this is due to something wrong with how I'm setting up the problem, or something about how gradient descent works on different types of data. 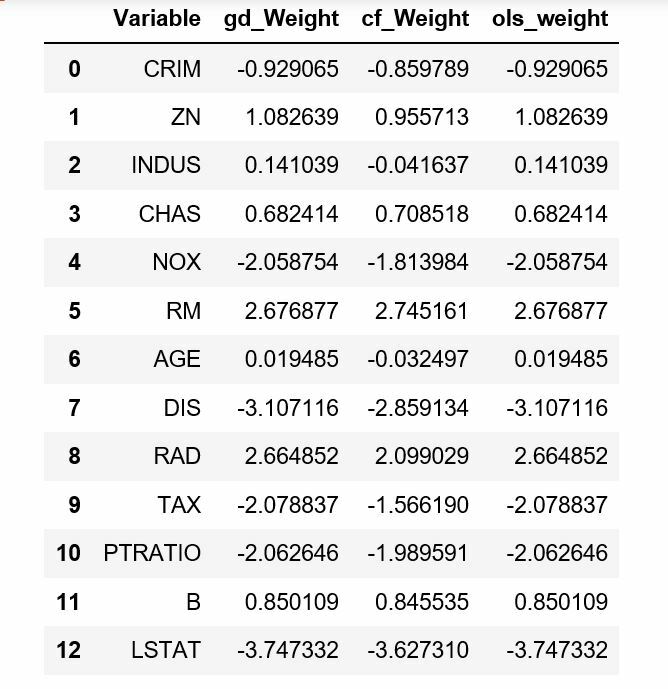 The dataset I'm using is the boston housing dataset, which is very small (506 rows), and has a number of correlated variables. I'd love to be corrected if my priors are inaccurate, but this is how I frame the problem. Where output is the dot product of the feature matrix and the weights for each column + intercept. Where alpha is the tuning parameter and omega represents the regression coefficient, squared and summed together. We then take the result of this expression and multiply it by the learning rate, and adjust each weight appropriately. This looks right to me, but I'm not sure how to interpret the fact that the results are always the same as OLS, vs what I'd get using the closed form of Ridge Regression. Even if I set the value of alpha to something very large, like 1000, the results do not change. They all have roughly the same intercept of 22.5. I'm not very well versed in Python, but if I interpret your code correctly then X.T.dot(gradient) takes the gradient variable you computed on the previous line, and computes its dot product with $X$. This doesn't seem right since 'gradient' includes the "L2-gradient" which shouldn't be multiplied by $X$. Only the residual (y-self.output(X)) should be in that product. You want to add the L2-gradient only afterwards, and then multiply the result by eta. Also, the L2-gradient shouldn't sum over the $w$'s (remember the gradient should be vector-valued since you're taking the derivative of a scalar-valued function w.r.t a vector). Together these errors probably explain the confusing results you're getting, although I would have expected with an incorrect gradient like that the output would actually just be garbage rather than the OLS-solution, so there is probably something subtle happening that I'm not seeing. Going forward I would recommend first checking your implementation of each individual part of the cost function and gradient and satisfy yourself that they are correct, before running gradient descent. Not the answer you're looking for? Browse other questions tagged regression python regularization ridge-regression numpy or ask your own question. Is ridge regression useless in high dimensions ($n \ll p$)? How can OLS fail to overfit? How To Choose Step Size (Learning Rate) in Batch Gradient Descent?